Serving Tray. 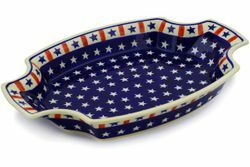 As always with Polish Pottery, this stoneware Serving Tray is the ultimate in versatility. Striking colors and generous proportions make this Serving Tray ideal for casual dining. Polish pottery stoneware can be placed in the dishwasher and microwave, and is also chip-resistant and lead-free. The cleanup couldn't be easier - nothing sticks! This stoneware tray comes in a multitude of patterns to suit any taste.